Having made many a plant-based pumpkin pie in my time, at this time of year I find myself again on the lookout for a new variation on the pumpkin pie theme. 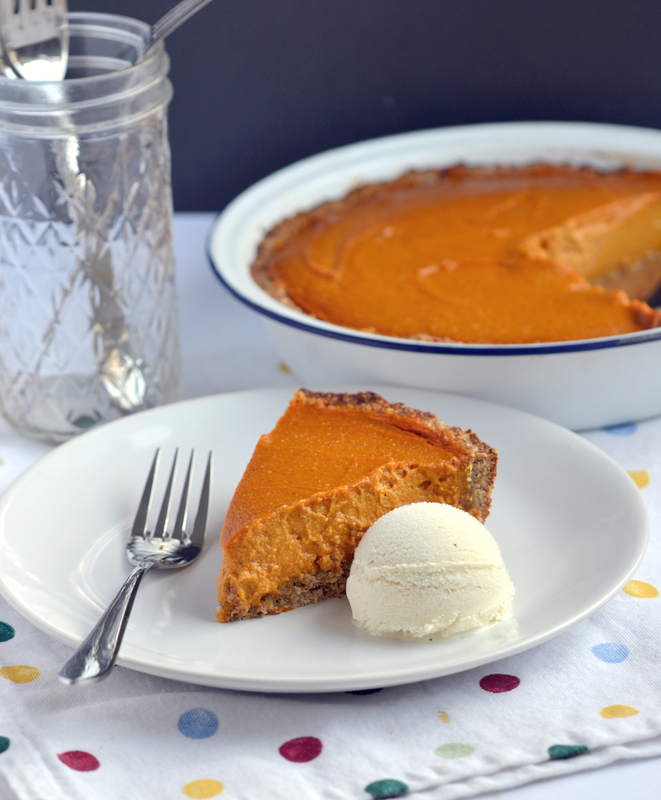 Oddly enough, as a kid I couldn’t stand pumpkin pie – go figure! It was only when I started creating the plant-based pumpkin pie options that I really took to this dessert. I started my search this time at the place I always turn to when looking for low-fat plant-exclusive recipes: My friend Susan Voison at the Fat Free Vegan Blog. Susan’s pictures are among my favorite food pics on the web. I don’t know how she does it. but her snapshots of even simple fare screams designer food and always get me fired up about making whatever it is she has created. This time was no different. Then I saw that Cathy Fisher of Straight Up Food has a new pumpkin pie recipe, as does Dreena Burton over at Plant-Powered Kitchen. This gave me five recipes to bring to your attention in short order. Soon a sixth was brought to my attention, which I’ve added for you as well. And I thought, why not share with you the benefit of my search? Though none of these recipes have animal products, true to the plant-based title on this article, I would not venture to claim that they are all ‘health food’ or even all ‘healthy options’. They floated to the top of the list, each with varying degrees of processed or unprocessed ingredients. 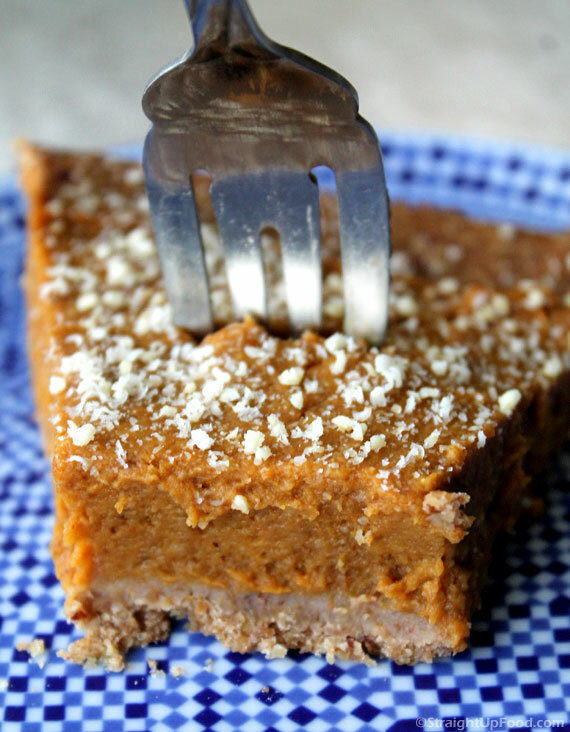 Choose The Plant-Based Pumpkin Pie That Works For You! Each of the recipes below has a place. So rather than choose for you, I thought I’d share with you these six plant-based pumpkin pie options and let you choose which works best for you. I’ve provided a snapshot of each for you along with links to the appropriate website so you can take a look at the recipe and decide what you might like to make. On the plant-based adventure, there are many stages and many venues for presenting plant-based food for family, friends, and even yourself. Having more options than either traditional high-fat animal product or orange pile-of-twigs-and-bark – opposite ends of the spectrum – I offer you these ideas in the hopes that it helps you find a best match for what you can use during the holidays. Besides, this way I have them all linked in one place for future reference. Thinking! “This is not a fat-free recipe” disclaimer here. Geez, what was I thinking when I named this blog! Double-Layer Pumpkin Cheesecake is undoubtedly the richest of the six recipes featured here today. It has a commercial graham cracker crust as well as a layer of highly processed tofu cream cheese. It is also argueably the one most sure to please at the omnivorous holiday table where everyone else maystill quizzically respond “vege-what?” when then discover your dietary persuasion. I’ve made this recipe for dinner guests without even mentioning what’s on the ingredients list and it was a huge hit. No need to knock people over the head with “tofu this” and “egg-free that” unless they express interest. Which, by the way, they will do with this recipe. You can find the recipe for Susan’s Double Layer Pumpkin Cheesecake here. This particular recipe uses a pre-made pie crust, which you can of course get around by making your own. Just like the Double Layer recipe above, it calls for a lot of extra sweet in the form of sugar. This one I haven’t made, but it looks like it might taste ‘traditional pumpkin pie’ if that is what you are looking for. 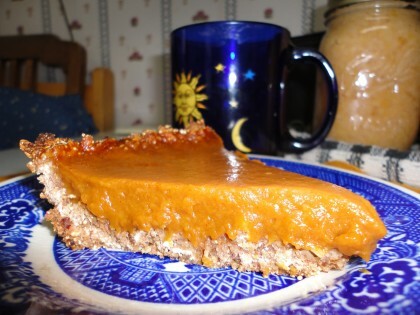 You can find the recipe here: Bryanna’s Vegan Pumpkin Pie. 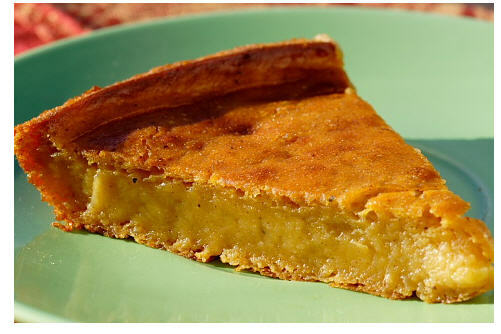 Though the inside is more like a custard than a regular pumpkin pie, a slight crust formed along the bottom and sides of the pan, so you can actually pick up a slice of this pie and eat it like a piece of pizza. But it’s dangerously addictive, as shown by the fact that my husband ate about 6 pieces of it yesterday! 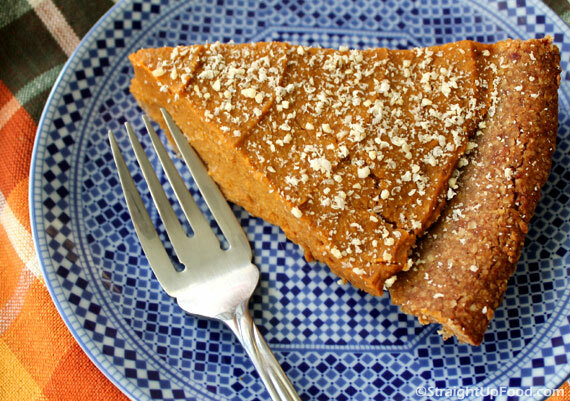 Click here for the recipe for Impossible (crustless) Vegan Pumpkin Pie. Wait… Do we really need another pumpkin pie recipe? Why is this one special? Indeed, there is no shortage of pumpkin pie recipes – even vegan. A quick google search will confirm that. I’ve baked my fair share of pumpkin pies. Crusts made with graham or cookie crusts, fillings with silken tofu or chocolate, the list goes on. But, ever since creating the Pumpkin Pie Custards in Let Them Eat Vegan, I’ve wanted to somehow transform the recipe into a pie! It needed tweaks, to thicken and stabilize. Plus, I wanted to develop a crust that was (1) wholesome and (2) EASY (we need some breaks during the holidays)! 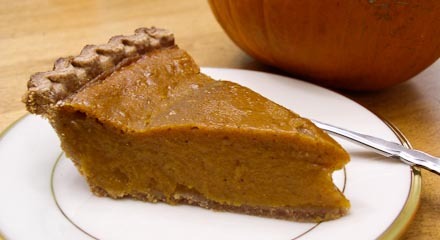 For Dreena’s Great Pumpkin Pie recipe, click here. To download Cathy’s Pumpkin Pie Straight Up recipe, click here. The fat free, gluten free, soy free world, that is. I was just about to click “publish” on this pie extravaganza piece when Maria from Plant-based Slow Motion Miracle saw my conversations on facebook about same and jumped in with this contribution. Like Fisher’s Straight Up recipe, Maria contributes a from-scratch crust with oats, pecans, and apple sauce. Plus Maria’s story is so unique and inspiring – how she is successfully managing MS, Fibromyalgia and mild Cerebral Palsy with a plant-based diet – it is worthy of your attention. You will find Moonwatcher’s Free World Pumpkin Pie recipe here. Please share in comments below which recipe catches your attention – and why! Have you made one of them, or do you plan to? Hi Jodie! Thanks for the addition to the list – this is great! 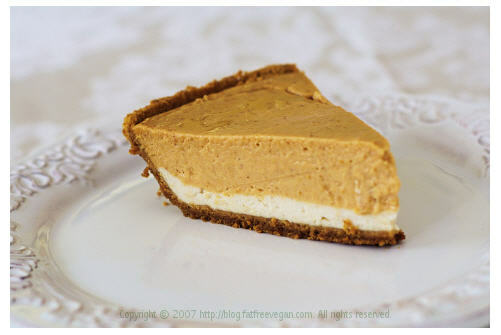 Tofu pumpkin pie like this is what I have made most often when it comes to plant-based pumpkin. I’m glad you added the link. Lani, thank so much for your kind words about my photos and for including my recipes here. I feel honored to be among such illustrious company! Susan, your graciousness only adds to the appeal of all that you do with food – thank you for the great recipes and I’m sure many will benefit from your generosity. My sentiments exactly – have you made it? if you do, let me know how yours comes out!